-Cream butter and brown sugar with mixer. -Beat in egg yolk and vanilla. 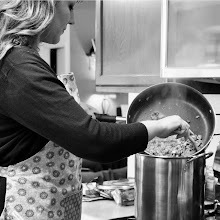 -Gradually add flour and salt, beating until smooth. -Spoon into lightly greased 15x10 pan. (Use 13x9 if you want thicker shortbread, but it may require a slightly longer bake time.) Press down in pan until dough is even. -Bake at 350° for 17-19 minutes, or until LIGHT golden brown. 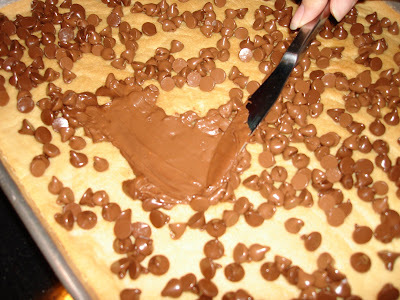 -Remove from oven and immediately sprinkle chocolate chips over top. -Return to oven for about 2 minutes. 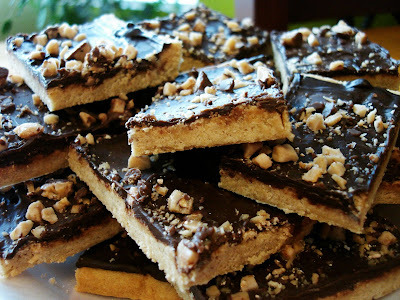 -Gently spread melted chocolate evenly over bars. -Sprinkle crushed heath bar evenly over the top. ***If plating bars, place in refrigerator to cool for about an hour. Remove and slice into bars. Cover and place back into refrigerator for a few more hours or overnight or until the chocolate on top is no longer soft so they can be stacked on a plate and not stick together.